Gujarat Secondary & Higher Secondary PRINCIPAL Bharti (HMAT) Online School Selection Notification Declare. Ojas info india: Gujarat Secondary & Higher Secondary PRINCIPAL Bharti (HMAT) Online School Selection Notification Declare. Gujarat Secondary & Higher Secondary PRINCIPAL Bharti (HMAT) Online School Selection Notification Declare. 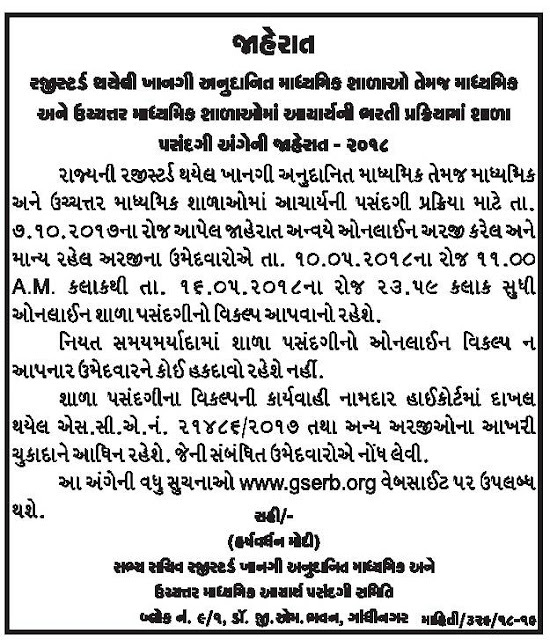 Gujarat Secondary & Higher Secondary Education Recruitment Board (GSERB) has published important notification regarding extension of 2329 Principal Posts, Check below for more details.